A hammock is one of those things that you should own if you like spending some good time outdoors. Whether you are out camping in the woods or relaxing in your backyard, the Gold Armour XL Double Hammock will be an excellent choice for you. It is a high-quality 210T parachute nylon product that comes with some heavy-duty carabiners and a couple of 10-feet long straps with 16 loops each. The extra large size makes it spacious enough for sharing. It can withstand up to an impressive 500 pounds. There are more than a dozen adorable color options available. 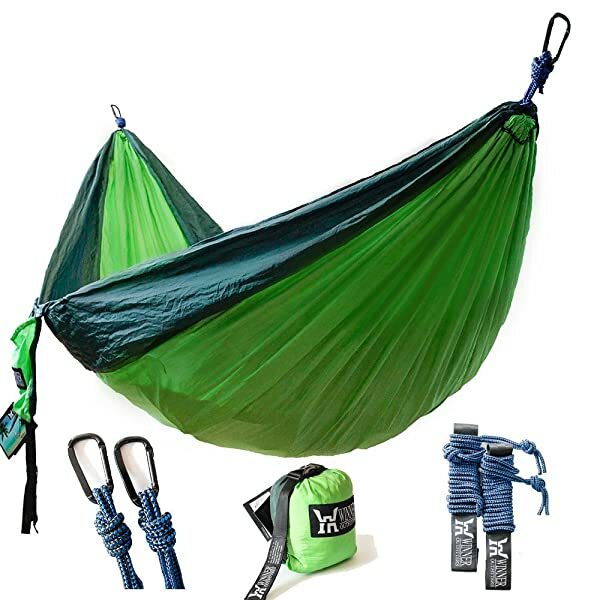 The nylon parachute and super strong ropes make it a very reliable and durable hammock. It also includes a carrying sack for easy transportation. Gold Armour provides everything you need to use it including heavy duty carabiners and tree-friendly straps. You will get a fantastic 15-year warranty to ensure you have nothing to lose when you buy this hammock. The price tag is excellent for such a high-quality double hammock. Although assembling the hammock is easy some clear instructions would still have been helpful for some people. Not very ideal for use in cold weather. The sack is a little bulky to carry. A hammock is one of those things that you should own if you like spending some good time outdoors. Whether you are out camping in the woods or relaxing in your backyard, the Gold Armour XL Double Hammock will be an excellent choice for you. It is a high-quality 210T parachute nylon product that comes with some heavy-duty carabiners and a couple of 10-feet long straps with 16 loops each. There is also a small carry sack to store and transport the hammock. And it will withstand up to 500 pounds to make it ideal for sharing. Material: Like most other high-grade hammocks it is a 210T parachute nylon product. And so it will be lightweight for easy portability, and it is also soft, breathable and mildew resistant to ensures that it lasts for many years. Weight Capacity: It can withstand up to 500 pounds, and since it is also very spacious it is possible for 2 to 3 people to use it at the same time comfortably. The ropes, on the other hand, will withstand a combined weight of 1,000 pounds. Size: The dimensions of this double hammock are 125 x 79 inches which makes it extra large. As for the weight, it will weigh about 1.5 pounds when you pack it down. 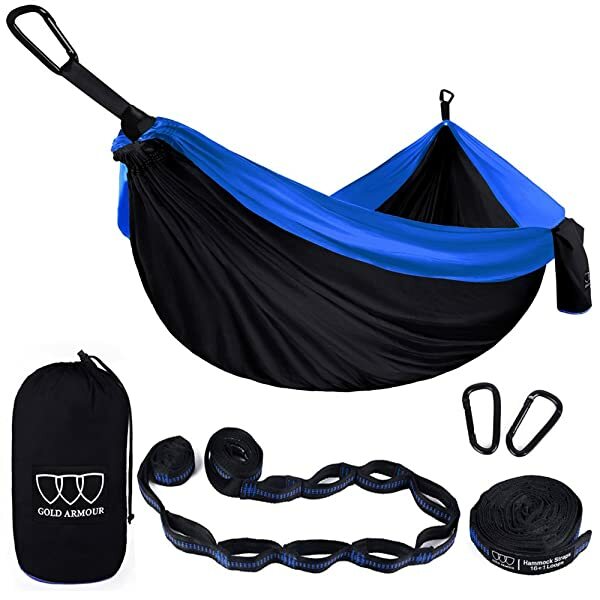 What is In the Package: Besides the double hammock you will also get two 10-feet long tree straps with 16 attachment loops and a couple of heavy-duty steel carabiners. 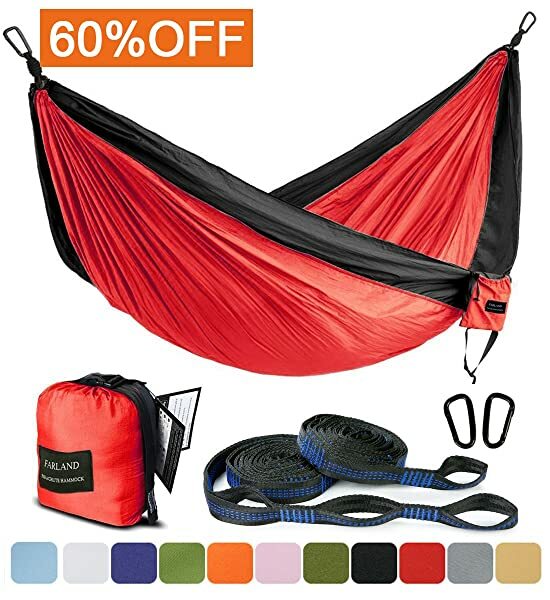 Guarantees: The hammock comes with a 15 years warranty, and the manufacturer offers, a remarkable money back guarantee by promising to refund your cash in just 5 hours while also letting you keep the hammock. 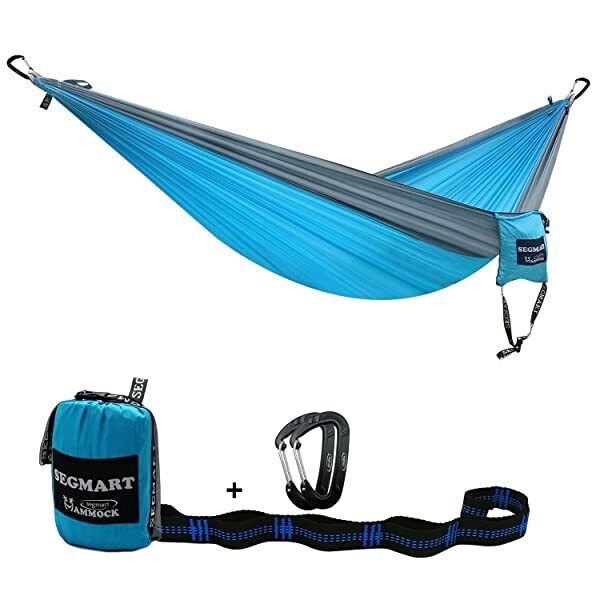 The fact that Gold Amour provides an impressive 15 years warrant (which is rare for hammocks) is enough to convince you that this is a top-notch product. But, they still go further to provide an unbeatable money back guarantee whereby they return your cash in just 5 hours and with no questions asked while also letting you keep the hammock. However, you will probably not need your money back as it uses a high-quality parachute nylon that makes it very durable. It also comes with some high-quality and non-stretching ropes that are long enough and tree-friendly. There are many other positive elements about this hammock, but the fact that it can accommodate 2 to 3 people at a go is probably what many people will like. And with almost no shortcoming at all this is a top-notch hammock that you will not regret buying. 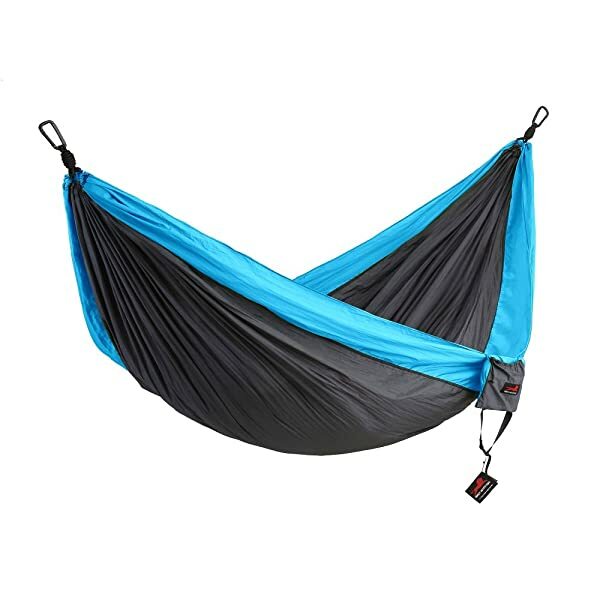 Check out here to see top 5 camping hammock on the market.